U.S. stock futures are pointing lower in premarket trading for Friday, November 4. The Dow Futures are at 17838.0 for a loss of -14.00 points. The S&P 500 Futures are at 2083.75 for a gain of 0.25 points. The Nasdaq Futures are at 4671.5 for a loss of -3.00 points. The Russell Futures are at 1153.4 for a loss of -1.00 point. Investors are still worried about the election’s affect on the economy and third quarter earnings are mixed. Investors will be closely watching the October jobs report for insight on the economy and the Fed’s next rate increase. Other economic reports affecting the day’s trading include the following: International Trade and the Baker Hughes Rig Count. Fed speakers on the calendar for Friday include Dennis Lockhart, Rob Kaplan and Stanley Fischer. Approximately 40 companies will report earnings on Friday. Warren Buffett’s Berkshire Hathaway will report earnings after the market’s close. U.S. market indexes were lower Thursday. 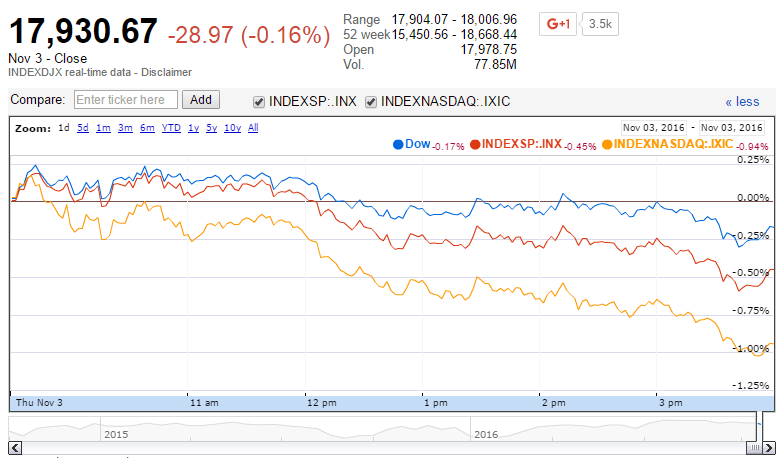 For the day the Dow Jones Industrial Average closed at 17930.67 for a loss of -28.97 points or -0.16 percent. The S&P 500 closed at 2088.66 for a loss of -9.28 points or -0.44 percent. The Nasdaq Composite closed at 5058.41 for a loss of -47.16 points or -0.92 percent. Other notable index closes included the small-cap Russell 2000 Index at 1156.89 for a loss of -5.64 points or -0.49 percent; the S&P 600 Small-Cap Index at 703.64 for a loss of -2.04 points or -0.29 percent; the S&P 400 Mid-Cap Index at 1476.68 for a loss of -2.62 points or -0.18 percent; the S&P 100 Index at 926.63 for a loss of -5.06 points or -0.54 percent; the Russell 3000 Index at 1231.62 for a loss of -5.38 points or -0.43 percent; the Russell 1000 Index at 1156.08 for a loss of -5.00 points or -0.43 percent; and the Dow Jones U.S. Select Dividend Index at 587.35 for a loss of -1.09 points or -0.19 percent.